“Along the Cooper River: Camden to Haddonfield” is the newest addition to Arcadia Publishing’s popular “Images of America” series that tells a story in pictures. The book by Cherry Hill authors Robert A. Shinn and Kevin Cook was released earlier in the year. It boasts 200 vintage images, many of which have never been published, and showcases memories of days gone by. “The book provides wonderful glimpses of the river. We learned a lot of in the process,” Shinn said. Shinn, treasurer of the Camden County Historical Society and a member of the Haddonfield Historical Society, and Cook, a member of the CCHS and the Cooper River Watershed Association, were inspired to write the book when they were trying to save the Wallworth Park clubhouse in Cherry Hill from demolition and succeeded, and found the Cooper River Park was being nominated to be on a state and national register for historic places. They worked with the state Historic Preservation Office to submit Cooper River as a historical place, which can mean funding and grants for the sites and parks. It has not yet been approved. Through their research, they developed such a wealth of knowledge and information about the Cooper River, they decided to put it together in the book. They worked with the CCHS, HHS and other organizations and individuals to put together photos and information for this sort of “visual” novel, as the book is primarily images with captions. “It is primarily images and photographs on most of the pages. As they say, ‘a picture is worth a thousand words.’ Well these are pictures with text, so they are worth about 2,000 words,” Shinn said. “Along the Cooper River: Camden to Haddonfield” focuses on the communities of Camden, Pennsauken, Cherry Hill, Collingswood, Haddon Township and Haddonfield, and how each has played a unique role in the long and rich history of the Cooper River and its evolution into a nationally significant recreational area. The book is mostly in chronological order starting with its Lenape roots, then on to the English Quaker settlers, through the revolutionary and industrial eras, and up until the depression and Franklin Roosevelt’s administration in the 1920s and 30s. “The river was really the original highway in Camden County. Until the dam was put in, it was a free flowing tidal river that was used for transportation, importation and exportation to and from Philadelphia,” Shinn said. Highlights of “Along the Cooper River: Camden to Haddonfield” are that a portion of the royalties from the sale of the book are being donated to the CCHS; it locates and describes significant historical events along the Cooper River including early Quaker settlement of Cooper’s Ferry and Haddonfield and Quaker efforts to abolish slavery; information on the Ebenezer Hopkins House in Haddon Township and featured figures such as Elizabeth Haddon, Hopkins and his great grandson who found the bone of the famous Hadrosauraus that William Parker Foulke eventually dug up; and many photos in the book come from private collections that have not been seen by the public before. Shinn and Cook found putting together the book a good, but hard experience. As they could only use about 200 of the almost 1,000 photos they had, they had to make some tough decisions. However, they ultimately were able to do so and came out with a book that encompasses the great history of the Cooper River. “[My favorite part] was taking the amount of research that we had and whittling it down to 128 pages and writing only 70 work captions. It was interesting and very difficult at the same time. There’s a lot of history in a few words,” Cook said. “My favorite part was learning the history and politics behind the development of the park system. It was interesting how major public investments were made and by whom over time, seeing where people mixed public and private interest,” Shinn said. Shinn and Cook will be speaking about their books to the Haddon Township Historical Society and the Pennsauken Historical Society in September, as well as at the Collingswood Book Festival. Also, both authors were inspired to start working on new books from their experience. Shinn is working on a book about the history of Petty Island in Pennsauken and its tie to the Cooper River and Philadelphia. Cook is working on a biography on Eldridge Johnson, the founder of the Victor Talking Machine Company and an advocate for the Cooper River Park being built. 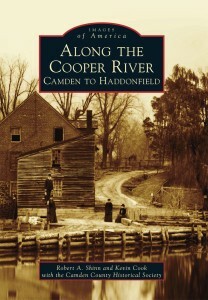 “Along the Cooper River: Camden to Haddonfield” is available at area bookstores, independent retailers and online retailers, or through Arcadia Publishing at (888) 313–2665 or www.arcadiapublishing.com.